Today I'm reviewing a little third party figure/accessory that serves to enhance your TransFormers collection. Remember in the G1 cartoon how Megatron would convert into a powerful pistol that another robot could wield? Well, the old toys never had an in-scale Megatron pistol, instead Megatron would transform into a toy gun YOU could play with. But now in this cool age of third party toys, we can finally have our "classics" Starscream blast Autobots into oblivion with his own Megatron handgun. Check it out! I don't know much about Master Shooter or have any previous experience with their products. 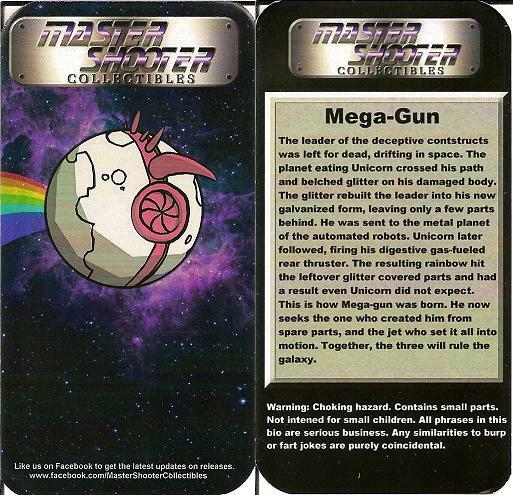 I only found out about "Mega-Gun" recently when I visited Big Bad Toy Store to shop for some toys. This item was available for pre-order on BBTS' front page. I was immediately fascinated and placed my order. Good thing I did, because the preorder was sold out soon after. 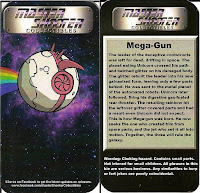 The folks at MSC take a tongue-in-cheek approach to the copy writing as showcased by Mega-Gun's bio. Is it wrong that I kind of want a Unicorn figure now? What MSC has created is essentially a Targetmaster-style robot, that converts into a weapon other robots can use. This just happens to be modeled after Decepticon leader and all-around, no-goodnik, Megatron. In robot mode the likeness is pretty great for such a small transforming figure. He's just over two inches tall and features some nice articulation points that double as his transformation points. Mega-Gun's forearm-mounted cannon doubles as the gun mode's scope, just like the real bot! It's removable, utilizing a small peg to hold it in place. The pistol mode is the real treat here as it's a decent representation of Megatron's G1 alt-mode with the barrel extension and getting there from robot mode is a cinch. You flip down his upper torso, rotating the arms upward, then bring them together. The scope is repositioned, plugging into the two small arm posts that are now side-by-side. The barrel flips up, as do the legs, revealing the handle. The handle post slims down towards the bottom to fit figures with smaller fist holes. The larger diameter on the upper part of the handle fits most of the classic TF figures, but it's bit loose in Starscream's fist. Generations Soundwave can't even hold it straight. There's also an adapter that allows you to hook up Mega-Gun to any of the Seeker jets. The adapter has two holes; the larger one fits around the hollow post under the wings of the fighter jets. The smaller hole on the adapter accomodates the handle on MG.
MSC also created an color variant of Mega-Gun based on Browning. BBTS was selling a set with each of these, but it's currently sold out. MG seems to be back in-stock as of this writing. I paid $17.99, plus shipping on this guy, and that's a bit steep for a 2" figure, but I've seen other similarly scaled toys go for more. Plus, it's a Megatron gun other figures can hold! It was well-worth the price for me. It seems MSC is focused on releasing other Targetmaster figures, with upcoming releases for use with Kup, Hot Rod and Scourge. I won't need their version of Firebolt thanks to FansProject's "Sidearm" figure, but I'm certainly interested in the other two.